Seam vegetables in batches. 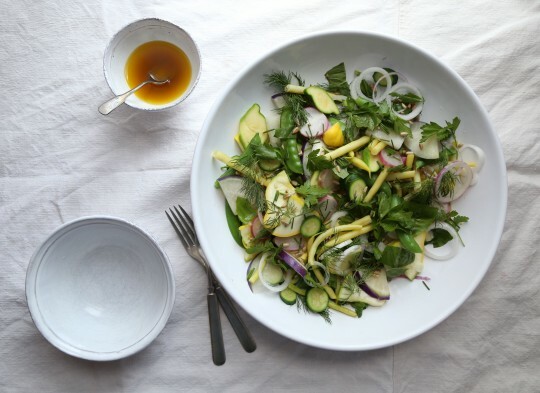 Zucchini, wax beans, radishes and kohlrabi can be steamed for 2 minutes each or until heated through, yet still crisp. Remove from steamer and spread out over a platter, wide bowl or a plate to cool. Steam sugar snap peas for one minute and add to vegetables. Set aside to cool completely before placing in a bowl and tossing with herbs, spring onions, chives and toasted sunflower seeds. Stir the dressing ingredients together and drizzle over vegetables. Toss in any desired add ins and serve immediately. This anti-cancer recipe was generously contributed by Amy Chaplin. Please visit her website for any additional details and to check out more of her delicious recipes!